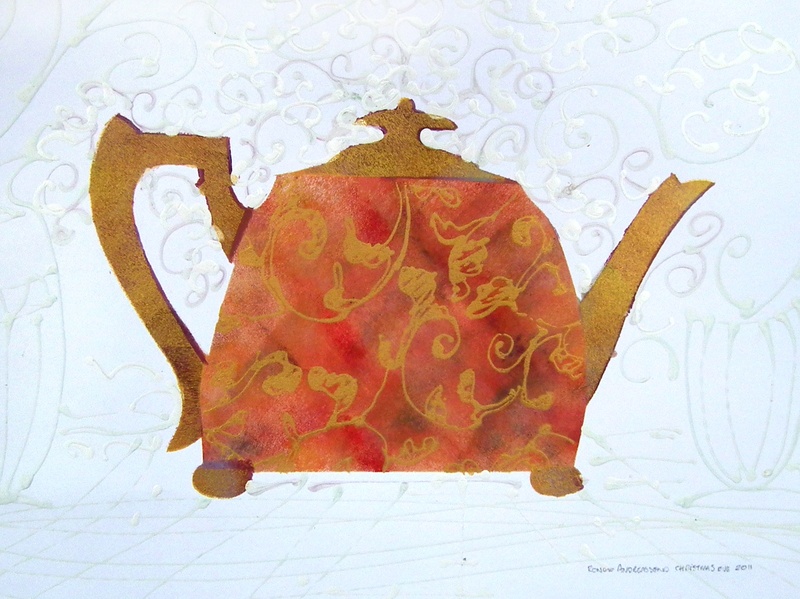 Author: Ronald Andreassend is an Object Designer working in ceramics, resin casting, screenprinting and paintings. 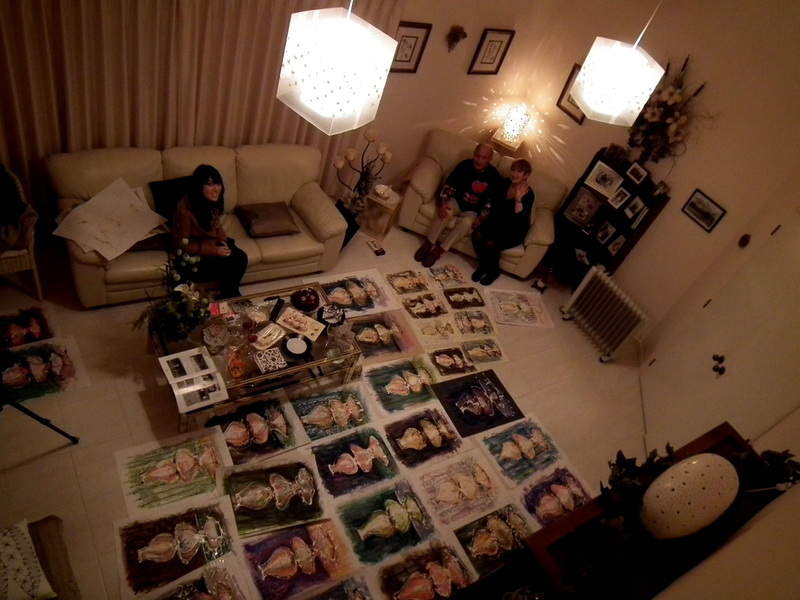 His work often reflects the New Zealand environment and increasingly explores family history, stories and cultural origins while researching family connections. Its been a long time since I heard that I had a Chinese Grandfather and a few years ago that his name was Jim Yuan, a few rumours but nothing more. The Andreassends and the Lums seemed to have no other contact with any Chinese in Timaru, I didn`t even know there was a vibrant Chinese community in Timaru. Apart from newspapers mentioning gambling and opium in Timaru nothing much exists on the internet. 20 April 2013 has become a red letter day in my search for the answer who is my Grandfather is. There is a rich history waiting to be discovered! It punched a hole so deep the impact is still felt 58 years later. For some it is past history and best forgotten, whereas others have no idea. Two drivers, both only sons. John`s headstone is located next to Hannah Lum in the Timaru cemetery. Also interned with Hannah is Gin Lung Ng age 11 months 12 January 1917. Ng is the family name of Charlie Lum and maybe related. to celebrate the festive season the painting can be be downloaded for printing or the desktop. Welcome to the new family website just in time for Mothers Day! There has been major changes, this began as a small project for my Father Jim`s 83rd birthday and is now so much more than just a website for the Andreassend Family in New Zealand. New Zealand is virtually as far away from Norway as one can go, back in the 1800`s it was a one way trip, never to return, all contact was lost and was till now the end of my Norwegian Heritage. 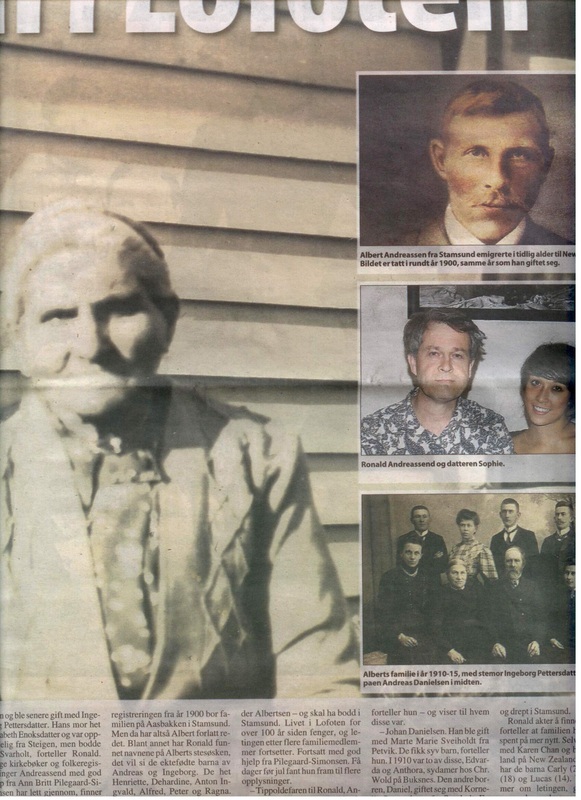 Both of my great grandparents have connections with Norway , Albert from the Arctic North departing about 1891 and Hannah`s mother from Telemark, in the Southern part of Norway immigrating in 1867. Its not everyday that you see your Great Grandmother described in such descriptive terms. This is a story that is so much bigger than the article even mentions, I have no idea where this will lead but it is a story deserves to be told. The things I have discovered have brought tears over the last 18 months, I never knew it could become this painful. This is not about hurting the memory of anyone, but to create an empathy and understanding of events that brought us to where we all are. I am inviting other artists to participate as well, but I would really like family to be part of this whether involved in the arts or not. 15 October 2011 The Family Tree has exploded in the last few weeks on Albert Marelius Andreassend both maternal and paternal side. When I first started the family tree, Albert`s mother Elisabet Enoksdatter was one person who intrigued and sadden me, found in two census, never married and died in the same year Albert was married in New Zealand. 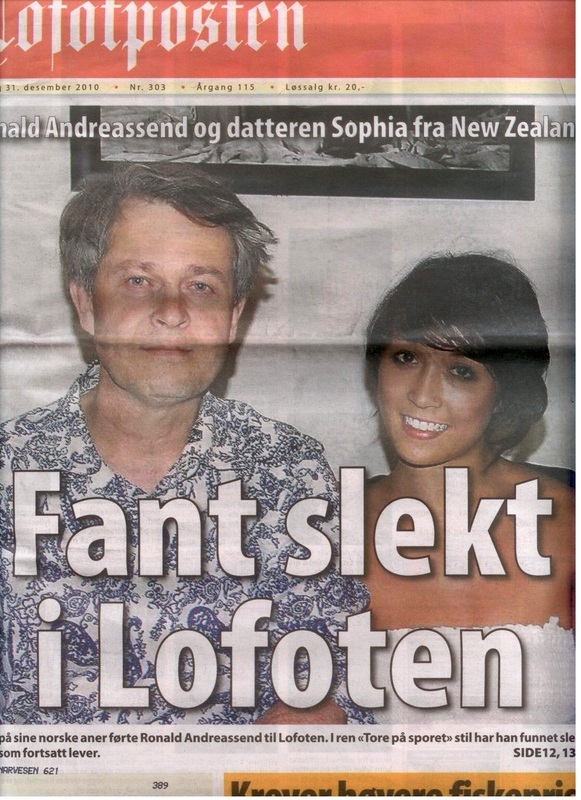 She just seemed to be the illegitimate offspring of a liason between two people born on remote farm on Engeløya. Maybe it was just wishful thinking but I just felt she deserved more than this. This time I found the connection, Elisabet was born on the Brunes Farm where her Grandmother had died the previous year. before. Her family tree goes back to 1575 with multiple generations living on Engeløya. Thanks to Vidar Johansen , who use to live on Engeløya, the family tree is now recorded at 5000 people. Looks like the website will need to be rebuilt again! 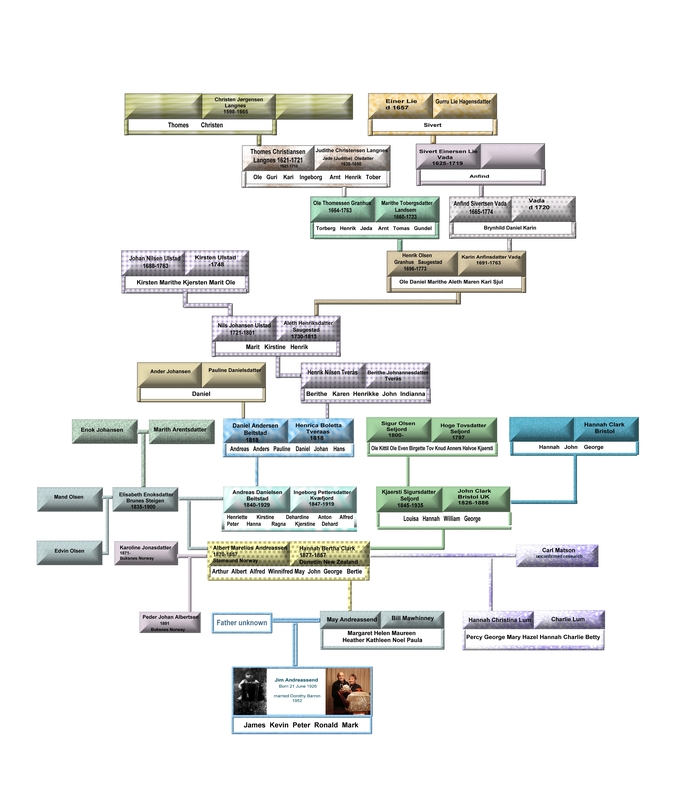 The family tree to 1598 , created to help celebrate Jim Andreassend`s birthday and to show how we all fit together. To celebrate Jim Andreassend`s 85th Birthday, a series of pastel and ink drawings based on Albert and Hannah`s Glass Lantern. " 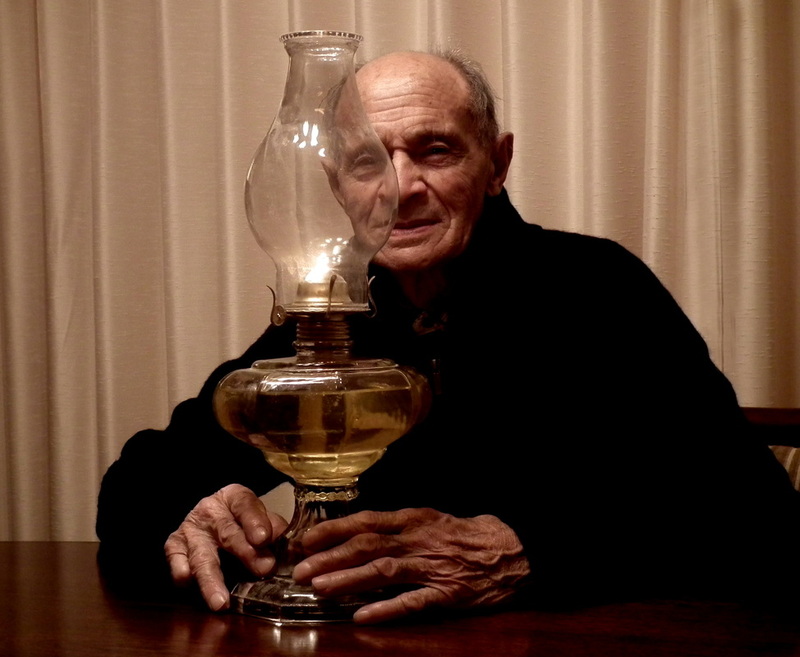 As source of illumination it gives a glimpse into the past, revealing the darker corners of family history so that it can be understood and shining brightly on those things that make us proud, its our heritage and it belongs to all of us." This series of Ceramic Lights and Handtools are inspired by Albert and Hannah`s objects. Celebrating the trades as well explores family histories and connections. 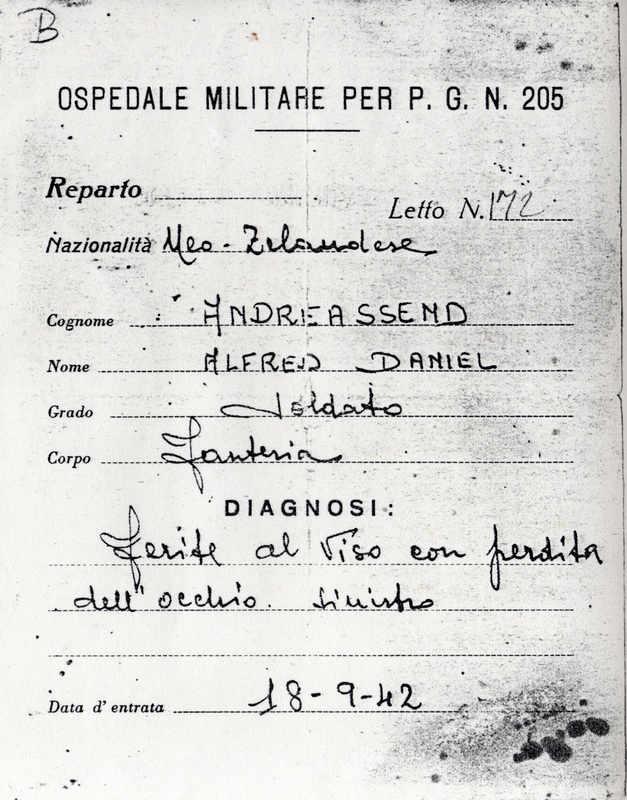 Alf was badly injured during the war, captured in Egypt and spent the war in Italy and Germany. His injuries required over 100 operations and continued for over 20 years. His was treatment was carried out in the Queen Victoria Hospital by Plastic Surgery pioneers Gillies and McIndoe. The revolutionary techniques inspired patients to form the World renowned Guinea Pig Club. A display is at The Cenotaph in the Auckland Museum. Gordon Andreassend was at home when this important letter was delivered, he was told to rush this to his Mother( Ivy) at work. It was the first indication than Alf was alive, he had been missing for 6 months, Gordon and Noel never knew. Albert and Hannah Andreassend Wedding Day. 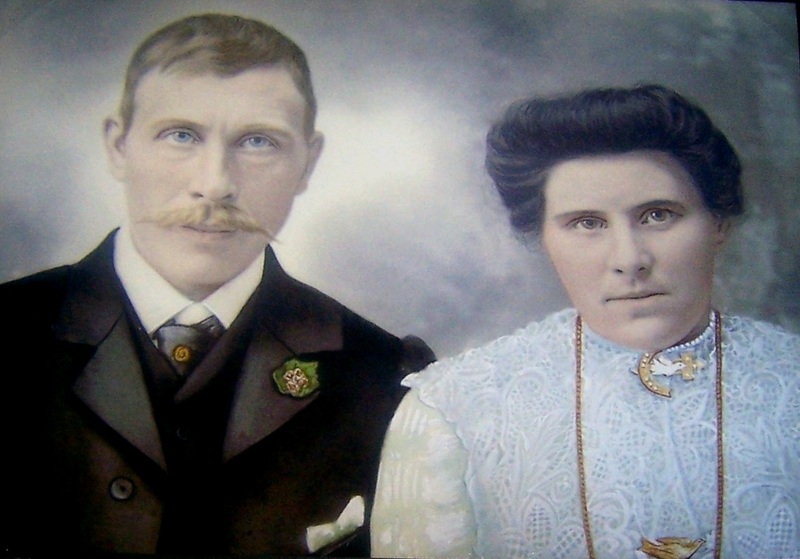 Albert and Hannah married on the 3 January 1900 and this became the beginning of the Andreassend family in New Zealand. Albert and Hannah have estimated 250 descendants! 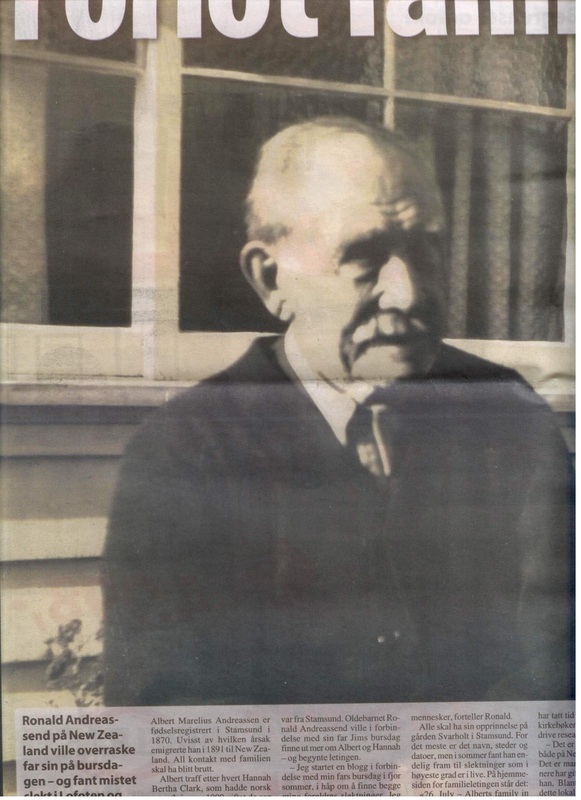 They lived through two depressions and two World Wars, they faced tragedies and they still managed to bring up a very large family as well as their grandchildren, The Lums and my father Jim Andreassend in a small town called Timaru. The Ship Palmerston departed Hamburg, Germany 28th July 1872 along with Kjaersti there were over 270 immigrants heading towards New Zealand on a journey lasting 4 months. December 24. We left the ship for the Emigrants Barracks, Princes Street, Dunedin and had dancing and music there for Christmas Eve, after a fortnights spell on board with a liberal supply of victuals from Dunedin." Every family has their stories, aspirations, connections, celebrations and milestones. As well as the shadows that are sometimes cast over a generation. Some are from immigration, circumstance, war, culture, mistakes, ignorance and seemingly fate. Our Family is no exception. The 19th Century was a time of mass migration for thousands Europeans eager to escape to a better life in countries like Canada, USA, Australia and New Zealand. 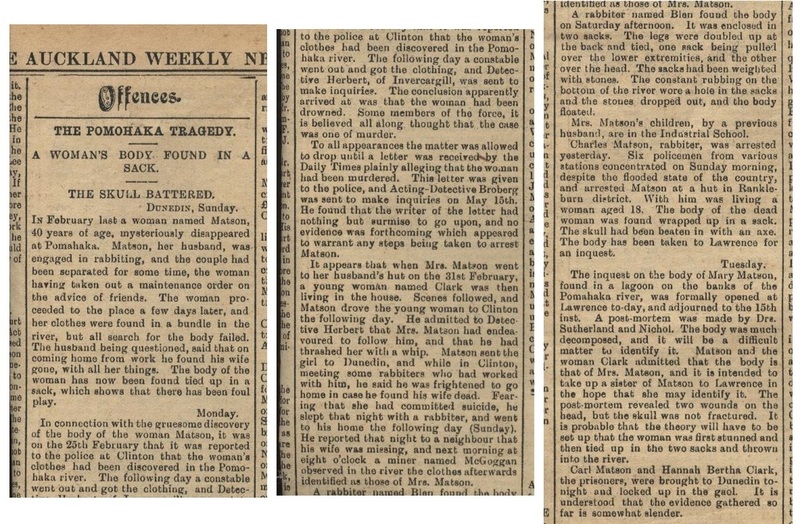 The trips were dangerous and took several months often leading to death along the way. 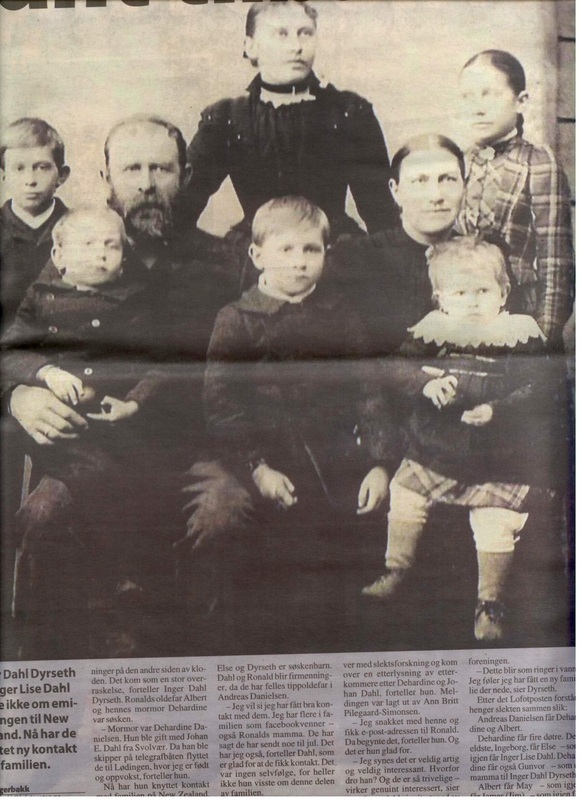 John Clark is the first ascendant of the Andreassend Family to arrive in New Zealand in approximately 1861, Kjearsti Sigurdsdatter was the second to migrate here arriving 6th December 1872 on The Palmerston. Kjearsti (also known as Kristi/ Christina) married John Clark and were the parents of Hannah Bertha Clark, their second child, who married Albert Marelius Andreassen, from Stamsund in Norway. They then settled in Timaru New Zealand. In a time when NZ society aspired to be a better version of Britain, little compassion was shown to those who were outside the norms of society. Being poor, working class, foreign and in the case of the Chinese undesired. It was this environment and society, through World War 1 , The great Depression and World War 2 that Hannah and Albert raised their eight children, including their seven Chinese grandchildren, the six Lum Children and my Father Jim. 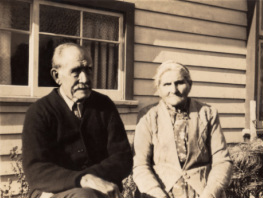 On the 3rd of January 2010 it was 110 years since the marriage of Albert and Hannah and the beginning of our Family in Timaru. This website project is to rediscover the stories and record the past for future generations to remember who our forebears were and where we came from. 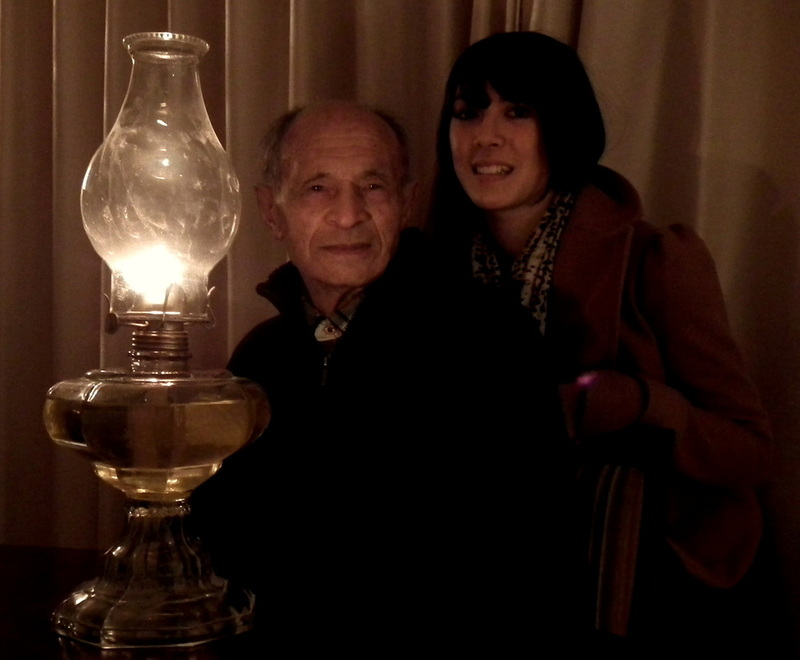 What began as a blog to celebrate my Dads 83rd Birthday has quickly grown to something so much more, including the wider family, their stories, photos and memories and most importantly reconnect the bonds of family. Acknowlegements I am grateful to Anne Lemon, without her generosity I would never have discovered where to start or developed an enthusiasm for research or find the Family Stories. and most of all encouragement. Extensive research in Norway by Ann Britt Pilegaard-Simeson has revealed present and past generations, her generosity and expertise has revealed so much. Ann lives in Alberts hometown of Stamsund. The Andreassend name is distinctive and very easy to trace, the wider family has a multitude of branches and this has made the task so much easier. All the contributions from photos, stories, information and memories that family and friends have sent in. The Family research continues in Norway with the stunning discoveries of Anne Britt who lives in Albert`s birth place Stamsund. She has reconnected the families on opposites sides of the world it appears a a century has past since Albert last had contact. are and where they connect in the family. Information is minimised for younger generations unless requested otherwise. simple searches on the internet or in a phone book.